The online British and Irish TV guide website Digiguide is reporting the exciting Nick UK news that Nickelodeon UK and Ireland and Nickelodeon HD UK, the number one commercial kids TV network in the UK, will start to premiere and show the popular animated fantasy television series "PopPixie" every Saturday and Sunday (Weekends) at 7:00am and 7:15am (replayed at 8:00am and 8:15am on Nick UK's plus-one timeshift channel, Nick+1) from Saturday 22nd February 2014, as part of "2014 on Nickelodeon UK"! In a faraway dimension there is a quirky, eccentric place called Pixieville. In this town, gnomes and all manner of magical animals live happily and peacefully together with the Pixies, sharing everyday life. But they are not alone: there are also the Elves, naughty creatures who are always ready to play a practical joke or stir up trouble - sometimes making Pixieville a challenging place to live! Each Pixie has a specific talent to develop and a mission to accomplish. By using their talents properly they can increase their magic powers and make the world a better - not to mention, more fun - place for everyone! "PopPixie" combines a large variety of worlds and characters with an iconic style. Packed with comedy and a spirit of adventure, the stories of "Pop Pixie" never fail to surprise with funny and outlandish situations – and a healthy dose of roll-on-the-floor laughter! Thanks to positive, feel-good themes, "PopPixie" inspires and empowers girls and boys alike, increases their self-esteem and provides positive role models, and is pure entertainment for the whole family! 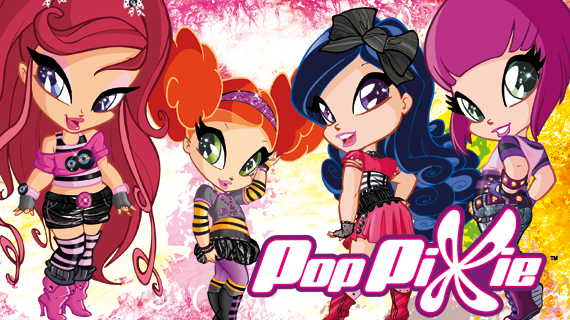 Nick.co.uk is expected to unveil their brand new official "PopPixie" show website to celebrate the shows debut on Nick UK & Eire soon. "PopPixie" is a Italian animation television series and a spin-off to "Winx Club". The series was created by Iginio Straffi and is produced by Rainbow S.r.l. Follow NickALive! on Twitter, Tumblr, Google+, via RSS, on Instagram, and/or Facebook for the latest Nickelodeon UK and PopPixie News! Labels: Animation, Nickelodeon Highlights, Nickelodeon News, Nickelodeon UK Highlights, Nickelodeon UK News, Non-Nickelodeon Made Shows On Nick UK, PopPixie, Rainbow S.r.l. Nickelodeon, the number-one entertainment brand for kids and families, has announced in the following press release, from TV by the Numbers, that, in honor of Black History month, Nick USA will premiere and show a brand-new "Nick News with Linda Ellerbee" special episode titled "Black, White, and Brown V. Board of Education: A Return to Segregated Schools?" on Tuesday 11th February 2014 at 8:00pm (ET/PT) and will roll out four new television spots featuring real kids talking about inspirational, contemporary African Americans who have broken barriers in their respective fields. "Nick News with Linda Ellerbee" will revisit the Brown vs. The Board of Education decision with "Black, White, and Brown V. Board of Education: A Return to Segregated Schools?". The half-hour special will focus on the landmark decision to abolish a system of segregation in public schools. The episode will also delve into current issues of inequality within the nation's public school system, highlighting the stories of two kids who have been affected by, what many perceive as, unequal access to a high quality education. Throughout the month of February 2014, Nickelodeon will spotlight contemporary African Americans who have made an impact, including: Mae Carol Jemison, a physician and NASA astronaut who became the first African-American woman to travel to space; Cullen Jones, the first African American to win an Olympic gold medal in the 4x100 meter freestyle relay; Quvenzhane Wallis, the first African-American child actor to be nominated for an Academy Award for her performance in "Beasts of the Southern Wild"; and Edward T. Welburn, Jr., vice president of Global Design for General Motors Corporation, who became the sixth lead designer in the company's history and the first African American to be appointed to that position. Beginning Saturday 1st February 2014, kids can log onto www.nick.com/thanks to watch online streaming video clips of Nick's brand-new Black History month spots as and get more information on Mae Carol Jemison, Cullen Jones, Quvenzhane Wallis and Edward T. Welburn, Jr.
NEW YORK – Jan. 30, 2014 – Nickelodeon, in honor of Black History month, will present a brand-new Nick News with Linda Ellerbee titled “Black, White, and Brown V. Board of Education: A Return to Segregated Schools?" on Feb. 11, at 8p.m. (ET/PT) and will roll out four new television spots featuring real kids talking about inspirational, contemporary African Americans who have broken barriers in their respective fields. Nick News with Linda Ellerbee will revisit the Brown vs. The Board of Education decision with “Black, White, and Brown V. Board of Education: A Return to Segregated Schools?”. The half-hour special will focus on the landmark decision to abolish a system of segregation in public schools. The episode will also delve into current issues of inequality within the nation’s public school system, highlighting the stories of two kids who have been affected by, what many perceive as, unequal access to a high quality education. Throughout the month of February, Nickelodeon will spotlight contemporary African Americans who have made an impact, including: Mae Carol Jemison, a physician and NASA astronaut who became the first African-American woman to travel to space; Cullen Jones, the first African American to win an Olympic gold medal in the 4×100 meter freestyle relay; Quvenzhane Wallis, the first African-American child actor to be nominated for an Academy Award® for her performance in Beasts of the Southern Wild; and Edward T. Welburn, Jr., vice president of Global Design for General Motors Corporation, who became the sixth lead designer in the company’s history and the first African American to be appointed to that position. Beginning Saturday, Feb. 1, kids can log onto www.nick.com/thanks to view the Black History month spots and get more information on Mae Carol Jemison, Cullen Jones, Quvenzhane Wallis and Edward T. Welburn, Jr.
Nick News, produced by Lucky Duck Productions, is now in its 23rd year and is the longest-running kids' news show in television history. It has built its reputation on the respectful and direct way it speaks to kids about the important issues of the day. Over the years, Nick News has received more than 21 Emmy nominations and recently won its 10th Emmy Award for Forgotten But Not Gone: What You Still Need to Know about AIDS and You in the category of Outstanding Children's Program. Additional Emmy wins for outstanding children's programming include: Under the Influence: Kids of Alcoholics, The Face of Courage: Kids Living with Cancer (2010); Coming Home: When Parents Return from War (2009); The Untouchable Kids of India (2008); Private Worlds: Kids and Autism (2007); Never Again: From the Holocaust to the Sudan (2005); Faces of Hope: The Kids of Afghanistan (2002) and What Are You Staring At? (1998). In addition, in 1995, the entire series won the Emmy. In 2009, Nick News was honored with the Edward R. Murrow Award for best Network News Documentary for Coming Home: When Parents Return from War — the first-ever kids' television program to receive this prestigious award. Nick News has also received three Peabody Awards, including a personal award given to Ellerbee for explaining the impeachment of President Clinton to kids, as well as a Columbia duPont Award and more than a dozen Parents' Choice Awards. Nickelodeon, now in its 34th year, is the number-one entertainment brand for kids. It has built a diverse, global business by putting kids first in everything it does. The company includes television programming and production in the United States and around the world, plus consumer products, online, recreation, books and feature films. Nickelodeon’s U.S. television network is seen in almost 100 million households and has been the number-one-rated basic cable network for 19 consecutive years. For more information or artwork, visit http://www.nickpress.com. Nickelodeon and all related titles, characters and logos are trademarks of Viacom Inc. (NASDAQ: VIA, VIA.B). Follow NickALive! on Twitter, Tumblr, Google+, via RSS, on Instagram, and/or Facebook for the latest Nick News with Linda Ellerbee News! 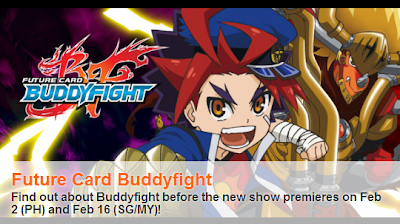 Nickelodeon Philippines will debut the all-new TV show "Future Card Buddyfight" on Sunday 2nd February 2014, with Nickelodeon Singapore & Nickelodeon Malaysia starting to air the series from Sunday 16th February 2014. Each new episode will air at 11:30am, with repeats on Sunday's at 4pm and the following Saturday at 11:30am. To celebrate Nick SEA starting to broadcast "Future Card Buddyfight", the networks official website has unveiled their brand-new official show webpage, which features show information and bios for each character in the series - Gao Mikado, Tasuku Ryuenji, Baku Omori, Kuguru Uki, Noboru Kodo, Paruko Nanana, Tetsuya Kurodake, Hanako Mikado, Drum Bunker Dragon (Drum), Jackknife Dragon (Jack), Demon Lord, and Asmodai. In "Future Card Buddyfight", based on the popular trading card game (TGC) of the same name, it is the year 2030, and the stage is the capital of Japan, Chou-Tokyo. Through "Buddyfight", humans have started cultural interactions with residents from other worlds called "Affinity Dimensions". Buddyfight is a game with selected humans as the "Buddyfighter", and residents from the other world as the partner (known as "Buddy Monster"). Gao Mikado, the main character of the story, is a student at Aibo Academy. Drum Bunker Dragon Fang Slade Terrestrial the 13th is an Armor dragon of Dragon World. With the power of a card game which connects both worlds, Buddyfight, the pair meet for the first time. "Future Card Buddyfight" is the story of their journey, and the deep bonds they forge with each other, as well as the various friends they meet along the way! Follow NickALive! on Twitter, Tumblr, Google+, via RSS, on Instagram, and/or Facebook for the latest Nickelodeon South East Asia News and Highlights! "Kushaboom" (8 episodes x 5 minutes) is a brand new preschool series set in a enchanted dance studio and features a group of four children, who will make up the 'Kushaboom crew', joining Nick Jr. and Nickelodeon presenter Helena Dowling and her puppet co-presenter, DJ Kusha, for a very special dance class. Using the mechanic of a magical dance floor that transforms into a globe, every episode will take the audience on a geographical adventure where they will explore a different dance culture and learn corresponding dance moves. The series, filmed in Hackney, London will also feature a child actress from the Stagecoach Theatre Arts Weymouth performing arts school. "Kushaboom" will also have a dedicated website on the official Nick Jr. UK website, NickJr.co.uk, which will feature exclusive interactive content, character information and online streaming video clips. To celebrate the debut of "Kushaboom" on Nick Junior, NickJr.co.uk has unveiled a brand-new "Kushaboom" online dance game called "Dance with Helena", in which you can dance along with Helena and Kusha by pressing the spacebar when the musical note reaches the box. The game helps to aid a child's physical development teaching them how to follow instructions and they're communication and language skills by teaching them the alphabet. Follow NickALive! 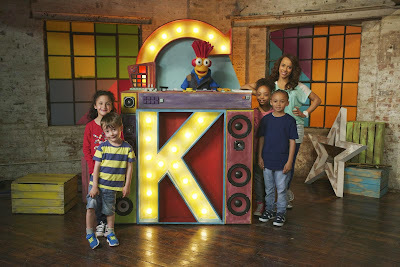 on Twitter, Tumblr, Google+, via RSS, on Instagram, and/or Facebook for the latest Nick Jr. UK and Kushaboom News! The animation news website Animation World Network (AWN) is reporting the exciting Nickelodeon News that Nickelodeon has today, Thursday 30th January 2014, announced its call for submissions for its 2014 global Animated Shorts Program, which is designed to identify and develop new animation talent and provide a platform for new content for kids! This year's Nickelodeon Animated Shorts Program marks the third year for domestic pitches and the second annual call for international submissions, continuing the search for a new set of creative voices and visionaries. The network will choose a minimum of 10 pitches to be developed into shorts that will appear on air, on www.nick.com and on the Emmy Award-winning Nick App. These shorts also have the potential of becoming long-form animated series on Nickelodeon. In 2013 Nickelodeon took over 1000 pitches worldwide for the program. "We're on an ongoing mission to create the funniest animated content for this next generation of kids, and find the freshest creative voices from around the world," said Russell Hicks, President, Content Development and Production, Nickelodeon. "The shorts program has already fueled our pipeline with new content and we're very excited to see what comes through our door this year." Ideas will be accepted from a broad pool of creative talent from all four quarters of the world including artists, designers, writers, directors and comedians. Creators will be provided with the necessary artistic and production support teams to help them complete their fully animated short. From the pitches received in 2013, 10 domestic and seven international pitches were chosen to be developed into animated shorts that will air on Nickelodeon, appear on www.nick.com, and on the Nick App throughout 2014. "The Loud House" created by Chris Savino, "Bear Wrestler" created by Deanna Rooney, "By Request Pizza" created by Arica Tuesday and Mick Ignis, "Hole" created by Sam Spina, "Matt and Gus" created by Matt Braunger, and "Charlie and Mr. Two" created by Travis Braun round out the previously announced domestic finalists: "Bug Salad" created by Carl Faruolo, "Earmouse and Bottle" created by Brian Morante, "Woodstump" created by Zach Smith, and "Broats" created by Jack Cusumano. The international animated shorts in development include "Badly Drawn Animals" by Hamish Steele (UK), "Louis and Georges" by Renaud Martin & Raphaël Chabassol (France), "Monster Pack" by Pedro Eboli & Graham Peterson (Brazil), "Moosebox" by Mike Scott (South Africa), "Scoop" by The Brothers McLeod (UK), "Tech Oddity" by Marco Ibarra and Stefie Zöhrer (Mexico), and "Tonk's Island" by Mel Roach (Australia). Gary "Doodles" Di Raffaele ("MAD", "Metalocyalpse"), discovered through Nickelodeon's inaugural Animated Shorts Program in 2012, is one of the creators and executive producers of Nickelodeon's brand-new upcoming animated series, "Breadwinners". Premiering in February, the 20-episode series, which is also created and executive produced by Steve Borst ("Teen Titans Go! ", "MAD"), follows two booty-shaking ducks as they operate a bread delivery service out of their awesome, jet-fueled rocket van. 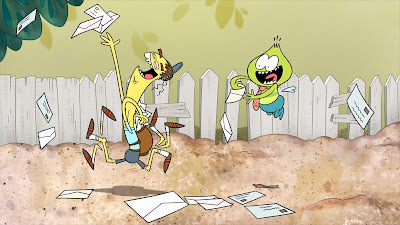 Nickelodeon Animated Shorts Program 2013: Bug Salad from Cartoon Brew on Vimeo. Follow NickALive! on Twitter, Tumblr, Google+, via RSS, on Instagram, and/or Facebook for all the latest Nickelodeon Animated Shorts Program News! Nickelodeon, the number-one entertainment brand for kids and families, has announced in the following press release, from PR Newswire, the very exciting Nickelodeon News that, to celebrate the 2014 Super Bowl, Super Bowl XLVIII, an American football game which will be held at the MetLife Stadium at the Meadowlands Sports Complex in East Rutherford, New Jersey on Sunday 2nd February 2014, Nickelodeon and the National Football League (NFL) are teaming up for the "Nickelodeon All Access Pass to Super Bowl XLVIII", which will give kids and families behind-the-scenes access to the performances, games, events and excitement taking place in New York and New Jersey leading up to Super Bowl XLVIII! Starting today, Thursday 30th January 2014, Nick USA will begin rolling out Super Bowl-themed content across Nickelodeon, TeenNick, Nicktoons and the NickMom programming block on Nick Jr., as well as on the channels' official websites and the Emmy Award-winning Nick App. Kids can log on to www.nick.com/superbowl to pick the team they want to win Super Bowl XLVIII, with the winning team announced prior to the game on Sunday, Feb. 2. 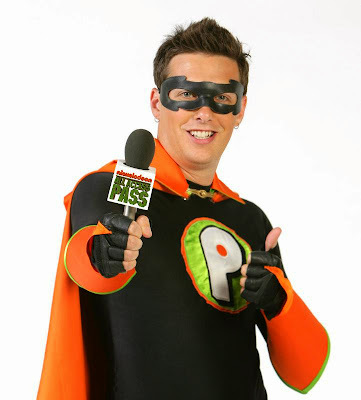 Additionally, Nickelodeon's resident superhero, Pick Boy, will report daily from the NFL's "Super Bowl Boulevard Engineered by GMC" and will also serve as Nick's on-the-ground correspondent during Super Bowl XLVIII Media Day Fueled by Gatorade. "I'm psyched to bring all of the excitement of this year's Super Bowl to kids across the country and be a part of giving them a chance to pick who they want to win The Big Game," said Pick Boy. "I've been to five of these Super Bowls. So, bring on the FOOTBALL! and chips, maybe some of those baby carrots too. I love those." Nickelodeon's programming line-up of exclusive Super Bowl-themed content, airing Thursday 30th January through to Monday 3rd February 2014 includes: the premiere of "TeenNick Top 10: Super Bowl Party Playlist", hosted by Nick Cannon and New York Giants wide receiver Victor Cruz on TeenNick; "Nickelodeon All Access Pass to Super Bowl XLVIII", an original half-hour, pre-game special on Nicktoons hosted by Pick Boy, who will also serve as a correspondent in daily vignettes giving fans the inside scoop on the week-long pre-Super Bowl celebrations taking place across New York and New Jersey; a Super Bowl-themed episode of "NFL RUSH ZONE", airing on Nickelodeon and Nicktoons; a football-themed season-two premiere of "Take Me To Your Mother with Andrea Rosen" on NickMom; and more. In addition to watching the action unfold across Nickelodeon's networks, viewers can log on to a dedicated Super Bowl XLVIII website (www.nick.com/superbowl) and the Nick App to follow along with all of the behind-the-scenes fun, and check out Super Bowl-themed games, interviews with players and more. Additionally, all three seasons of "NFL RUSH ZONE" are available on VOD throughout January 2014. Nickelodeon's full slate of original on-air programming and digital content for Super Bowl week can be found in Nickelodeon's original press release below. NEW YORK, Jan. 30, 2014 /PRNewswire/ -- Nickelodeon and the National Football League are teaming up to give kids and families behind-the-scenes access to the performances, games, events and excitement taking place in New York and New Jersey leading up to Super Bowl XLVIII, with Nickelodeon All Access Pass to Super Bowl XLVIII. Today, Jan. 30, Nickelodeon will begin rolling out Super Bowl-themed content across Nickelodeon, TeenNick, Nicktoons and the NickMom programming block on Nick Jr., as well as on the channels' websites and the Nick App. Kids can log on to www.nick.com/superbowl to pick the team they want to win Super Bowl XLVIII, with the winning team announced prior to the game on Sunday, Feb. 2. Nickelodeon's programming line-up of exclusive Super Bowl-themed content, airing Thursday, Jan. 30, through Monday, Feb. 3, includes: the premiere of TeenNick Top 10: Super Bowl Party Playlist, hosted by Nick Cannon and New York Giants wide receiver Victor Cruz on TeenNick; Nickelodeon All Access Pass to Super Bowl XLVIII, an original half-hour, pre-game special on Nicktoons hosted by Pick Boy, who will also serve as a correspondent in daily vignettes giving fans the inside scoop on the week-long pre-Super Bowl celebrations taking place across New York and New Jersey; a Super Bowl-themed episode of NFL RUSH ZONE, airing on Nickelodeon and Nicktoons; a football-themed season-two premiere of Take Me To Your Mother with Andrea Rosen on NickMom; and more. In addition to watching the action unfold across Nickelodeon's networks, viewers can log on to a dedicated website (www.nick.com/superbowl) and the Nick App to follow along with all of the behind-the-scenes fun, and check out Super Bowl-themed games, interviews with players and more. Additionally, all three seasons of NFL RUSH ZONE are available on VOD throughout January. "The Super Bowl is annually the most watched show of the year among kids," said Peter O'Reilly, Vice President, Fan Strategy and Marketing for the NFL. "We are excited to build upon our great, year-round partnership with Nickelodeon to give kids a unique, behind-the-scenes look at all the fun and festivities of Super Bowl week." Nick Cannon brings all the action from the Super Bowl XLVIII Media Day Fueled by Gatorade to a special TeenNick Top 10, packed with shout-outs from the players, an interview with New York Giants wide receiver Victor Cruz and a playlist of songs that will get them pumped up and ready for game day. During this special episode, the Super Bowl is taking place in New York and New Jersey, but with 30 Megacores missing, the Guardians, along with Houston Texans J.J. Watt and San Francisco 49ers Vernon Davis, must defeat Sudden Death before he sends Earth hurling into deep space. This half-hour special, hosted by Pick Boy, highlights the action of Super Bowl week through a kid-inspired lens. The show will feature exclusive player interviews, activities surrounding Super Bowl Boulevard Engineered by GMC in Times Square and an interview with the winner of the NFL PLAY 60 Super Bowl contest, of which Nickelodeon was the official youth media promotional partner. The winner of this year's contest, Thomas Brown, received a trip to New York City and the opportunity to run the official game ball out on the field at Super Bowl XLVIII. The series follows first-time mom Andrea Rosen's adventures around the country seeking advice from moms on what it takes to raise a great kid. In the season two premiere, Rosen discovers her son Odin is becoming a jock, so she visits Super Bowl XLVII Champion Baltimore Ravens players (DeAngelo Tyson, Ed Dickson, Arthur Jones) and their wives to immerse herself in the world of football. Nickelodeon, now in its 34th year, is the number-one entertainment brand for kids. It has built a diverse, global business by putting kids first in everything it does. The company includes television programming and production in the United States and around the world, plus consumer products, online, recreation, books and feature films. Nickelodeon's U.S. television network is seen in almost 100 million households and has been the number-one-rated basic cable network for 19 consecutive years. For more information or artwork, visit http://www.nickpress.com. Nickelodeon and all related titles, characters and logos are trademarks of Viacom Inc. (NASDAQ: VIA, VIA.B). Nickelodeon UK, the number one commercial kids TV network in the UK, has announced and confirmed in the following Press Release, from VIMN's official Nickelodeon UK & Ireland Press Centre, the very exciting Nick UK news that Nickelodeon UK and Ireland and Nickelodeon HD UK will premiere and show the "2014 Nickelodeon's Kids' Choice Awards", "Nickelodeon's 27th Annual Kids' Choice Awards", which will be hosted by the Oscar and Golden Globe-nominated actor/producer Mark Wahlberg ("Transformers: Age of Extinction"), on Sunday 30th March 2014 at 5:30pm (repeated from 6:30pm on Nick UK's plus-one (+1) timeshift channel, Nick+1), allowing Nick's UK and Irish audiences the chance to see all of the slime and star action less than 24 hours after the live US show! Following in the footsteps of last year's host, fellow "Transformers" actor Josh Duhamel, Wahlberg will be joined by Hollywood's biggest stars at the only awards show where kids call the shots. The annual event will take place in LA at USC's Galen Center on Saturday 29th March and UK audiences able to see all of the slime and star action less than 24 hours after the live US show. The nominees for the "2014 Nickelodeon Kids' Choice Awards" will be revealed in the upcoming weeks, giving kids all over the world their chance to vote for who takes home a coveted orange Nickelodeon blimp, the highest accolade a star can be given! "We cannot wait to see Mark Wahlberg take the reins for the first time as the host and master of slime at the biggest kid event of the year," said Tina McCann, Managing Director, Nickelodeon UK & Ireland. “As always it will be an action-packed event, where anything can happen and UK kids will soon be able to have their say and vote online for their favourite stars of TV, film, music and sport." Father of four, Mark Wahlberg earned both Academy Award and Golden Globe nominations for his work in the boxing film "The Fighter" and Martin Scorsese's acclaimed drama "The Departed". Notable film credits include "The Italian Job", "The Other Guys" and "Ted". Most recently, he played Navy SEAL Marcus Luttrell in "Lone Survivor". He will next be seen in Michael Bay's "Transformers: Age of Extinction". Wahlberg is also an accomplished producer of films such as "Lone Survivor", "2 Guns" and the upcoming "Entourage", as well as HBO shows "Boardwalk Empire", "Entourage" and "In Treatment". A committed philanthropist, he started the Mark Wahlberg Youth Foundation in 2001 to benefit inner city children and teens. Last year, the UK broadcast of the star-studded and slime-filled "Nickelodeon's 2013 Kids' Choice Awards" was the #1 rating broadcast across all kids' channels on Sunday 24th March 2013. The premiere garnered an average audience of 335,800 individuals including 233,600 kids aged 4-15, a 44% increase on the previous year's audience-winning viewership. The "2014 Nickelodeon's Kids' Choice Awards" will be seen in more than 375 million households around the world and in more than 25 languages. Within hours of airing live in the United States and Canada, the show will roll out internationally, providing kids around the world the opportunity to tune into their local Nickelodeon channel to enjoy the show faster than ever. To celebrate the "Nickelodeon Kids' Choice Awards 2014", Nickelodeon has launched localized KCA 2014 websites which will serve as a online destination for everything Kids' Choice Awards! NickHeads can visit KCA2014.com to vote for their favourite stars (coming soon! ), read the latest Kids' Choice Awards news, watch the latest videos and much more! "Nickelodeon's 27th Annual Kids' Choice Awards" is being produced by Nickelodeon Productions in association with Bob Bain Productions. Bob Bain, Jay Schmalholz and Shelly Sumpter Gillyard are Executive Producers. London – 30th January, 2014 – Oscar® and Golden Globe®-nominated actor/producer Mark Wahlberg (The Italian Job, Invincible and upcoming Transformers: Age of Extinction) will lead the fun as this year’s host at Nickelodeon’s Kids’ Choice Awards 2014, broadcast on Sunday 30th March at 5:30pm. Following in the footsteps of last year’s host, fellow Transformers actor Josh Duhamel, Wahlberg will be joined by Hollywood’s biggest stars at the only awards show where kids call the shots. The annual event will take place in LA at USC’s Galen Center on Saturday 29th March and UK audiences able to see all of the slime and star action less than 24 hours after the live US show. The nominees for this year’s awards will be revealed in the upcoming weeks and kids all over the world will have their chance to vote. Father of four, Mark Wahlberg earned both Academy Award® and Golden Globe® nominations for his work in the boxing film The Fighter and Martin Scorsese's acclaimed drama The Departed. Notable film credits include The Italian Job, The Other Guys and Ted. Most recently, he played Navy SEAL Marcus Luttrell in Lone Survivor. He will next be seen in Michael Bay's Transformers: Age of Extinction. Wahlberg is also an accomplished producer of films such as Lone Survivor, 2 Guns and the upcoming Entourage, as well as HBO shows Boardwalk Empire, Entourage and In Treatment. A committed philanthropist, he started the Mark Wahlberg Youth Foundation in 2001 to benefit inner city children and teens. Last year, the UK broadcast of the star-studded and slime-filled Nickelodeon’s 2013 Kids’ Choice Awards was the #1 rating broadcast across all kids’ channels on Sunday 24th March. The premiere garnered an average audience of 335,800 individuals including 233,600 kids aged 4-15, a 44% increase on the previous year’s audience-winning viewership. Available in 14 million homes, Nickelodeon is the place where kids rule and features top shows such as Nickelodeon's Kids' Choice Awards, Victorious, SpongeBob SquarePants and iCarly. Launched in 1993, Nickelodeon brings hit international and locally-produced entertainment content to audiences in the UK and Ireland. Viewers can also watch Nickelodeon in high definition through Nickelodeon HD and have the opportunity to catch up with the schedule through Nickelodeon +1. Exclusive games, behind the scenes clips, show information and more are available on nick.co.uk and the dedicated Nick app where viewers can find exclusive content which is updated daily. Nickelodeon is on Sky 604, Virgin 712, TalkTalk channel 315 and through BT Vision. The Nickelodeon Network brings the best in kids content to the UK and Ireland with Nickelodeon channels available in over 14 million cable and satellite homes. Having launched in 1993 Nickelodeon UK comprises seven dedicated entertainment channels for kids aged 4-15 and their families, and is a joint venture between Viacom International Media Networks and BSkyB. Follow NickALive! on Twitter, Tumblr, Google+, via RSS, on Instagram, and/or Facebook for all the latest Nickelodeon's 27th Annual Kids' Choice Awards News! Nickelodeon, the number-one entertainment brand for kids and families, has announced in the following press release, from PR Newswire, the very exciting Nickelodeon News that the Oscar and Golden Globe-nominated actor/producer Mark Wahlberg ("Transformers: Age of Extinction") will take the stage as host of this year's ultimate kid experience, Nickelodeon's 27th Annual Kids’ Choice Awards, airing live on Nick USA on Saturday 29th March 2014 (8-9:30pm ET/PT, tape delayed for West Coast)! Although currently unconfirmed, Nickelodeon UK and Ireland and Nickelodeon HD UK is expected to premiere the 2014 Nickelodeon Kids' Choice Awards the very next day on Sunday 30th March 2014, less than 24 hours after the ceremony is broadcast live across North America! Nick UK is also expected to air a special a special KCA Orange Carpet Countdown live from LA presented by some of the channels top presenters. The eminent slime-tastic night will return to USC's Galen Center and celebrate favorites across the worlds of film, television, music and more. Wahlberg will be joined by Hollywood's biggest stars in an unforgettable telecast where kids rule! Mark Wahlberg earned both Academy Award and Golden Globe nominations for his work in the family boxing film "The Fighter" and Martin Scorsese's acclaimed drama "The Departed". Notable film credits include "The Italian Job", "The Other Guys" and "Ted". Most recently, he played Navy SEAL Marcus Luttrell in "Lone Survivor". He will next be seen in Michael Bay's "Transformers: Age of Extinction". Wahlberg is also an accomplished producer of films such as "Lone Survivor", "2 Guns" and the upcoming "Entourage", as well as HBO shows "Boardwalk Empire", "Entourage" and "In Treatment". A committed philanthropist, he started the Mark Wahlberg Youth Foundation in 2001 to benefit inner city children and teens. Nick fans will be able to get in on the slime online and in the Emmy Award-winning Nick App this year, voting for their favorite actors, shows, movies, and musicians in all new ways. Beginning today, viewers can log on to Nick USA's official "Nickelodeon's 2014 Kids’ Choice Awards" website at nick.com/kca14 to get to know their "Kids' Choice Awards" host, Mark Wahlberg. Beginning in February 2014, the full "Kids' Choice Awards" digital experience launches across desktop and mobile devices. Leading up to the March event, fans can watch wacky videos, play funny KCA-themed games, and get constant updates on the slimefest to come. On March 29, viewers can head to Nick.com to see a live webcast of the "Kids' Choice Awards" Orange Carpet pre-show, and stay logged on during the show to see all the backstage action. Last year, Nickelodeon's 26th Annual Kids' Choice Awards, also known as "Nickelodeon’s 2013 Kids’ Choice Awards", was a slime-tastic extravaganza watched by more than 12 million total viewers over its weekend plays. The live premiere (March 23, 8 p.m.; all times ET/PT) drew 5.8 million total viewers and ranked as the top telecast of the week (3/18-3/24) with kids and tweens across all TV. Kids also paid tribute to their favorites by casting a record-breaking 392 million votes in 22 categories (including live voting during the Orange Carpet pre-show). The 2014 Nickelodeon's Kids' Choice Awards will be seen in more than 375 million households around the world and in more than 25 languages. Within hours of airing live in the United States and Canada, the show will roll out internationally, providing kids around the world the opportunity to tune into their local Nickelodeon channel to enjoy the show faster than ever. In many international markets, the 2014 KCAs will feature country-specific award categories and nominees, such as Sveriges Favoritstjärna (Favorite Swedish Star) and Migliore Cantante Italiano (Favorite Italian Singer). Voting for the 2014 KCAs will span six continents across 17 localized voting sites, giving kids practically everywhere the chance to decide who takes home a coveted orange blimp. The 2013 KCAs was the highest-rated ever among kids in many international markets, including the UK, Germany and Singapore. Ratings for the 2013 KCAs were up double-digits YOY internationally, and the show was rated #1 in its timeslot among kids' channels in key international markets, including the UK, Australia, Netherlands, Spain, Singapore, and more. Presenting sponsors of "Nickelodeon's 27th Annual Kids' Choice Awards" are General Mills, Hasbro Nerf Rebelle and Target. Associate sponsors are Bounty, Capri Sun, McDonald's and Toyota. "Nickelodeon's 27th Annual Kids' Choice Awards" is being produced by Nickelodeon Productions in association with Bob Bain Productions. Bob Bain, Jay Schmalholz and Shelly Sumpter Gillyard will serve as the ceremony's Executive Producers. Media outlets can reference the most up-to-date information on "Nickelodeon's 27th Annual Kids’ Choice Awards" by logging onto www.NickKCApress.com. SANTA MONICA, Calif., Jan. 29, 2014 /PRNewswire/ -- Oscar® and Golden Globe®-nominated actor/producer Mark Wahlberg (Transformers: Age of Extinction) will take the stage as host of this year's ultimate kid experience, Nickelodeon's 27th Annual Kids' Choice Awards, airing live on Saturday, March 29 (8-9:30 p.m. ET/PT, tape delayed for West Coast). The eminent slime-tastic night will return to USC's Galen Center and celebrate favorites across the worlds of film, television, music and more. Wahlberg will be joined by Hollywood's biggest stars in an unforgettable telecast where kids rule. Mark Wahlberg earned both Academy Award® and Golden Globe® nominations for his work in the family boxing film The Fighter and Martin Scorsese's acclaimed drama The Departed. Notable film credits include The Italian Job, The Other Guys and Ted. Most recently, he played Navy SEAL Marcus Luttrell in Lone Survivor. He will next be seen in Michael Bay's Transformers: Age of Extinction. Wahlberg is also an accomplished producer of films such as Lone Survivor, 2 Guns and the upcoming Entourage, as well as HBO shows Boardwalk Empire, Entourage and In Treatment. A committed philanthropist, he started the Mark Wahlberg Youth Foundation in 2001 to benefit inner city children and teens. Nick fans will be able to get in on the slime online and in the Nick App this year, voting for their favorite actors, shows, movies, and musicians in all new ways. Beginning today, viewers can log on to nick.com/kca14 to get to know their Kids' Choice Awards host, Mark Wahlberg. Beginning in February, the full Kids' Choice Awards digital experience launches across desktop and mobile devices. Leading up to the March event, fans can watch wacky videos, play funny KCA-themed games, and get constant updates on the slimefest to come. On March 29, viewers can head to Nick.com to see a live webcast of the Kids' Choice Awards Orange Carpet pre-show, and stay logged on during the show to see all the backstage action. Last year, Nickelodeon's 26th Annual Kids' Choice Awards was a slime-tastic extravaganza watched by more than 12 million total viewers over its weekend plays. The live premiere (March 23, 8 p.m.; all times ET/PT) drew 5.8 million total viewers and ranked as the top telecast of the week (3/18-3/24) with kids and tweens across all TV. Kids also paid tribute to their favorites by casting a record-breaking 392 million votes in 22 categories (including live voting during the Orange Carpet pre-show). The 2014 Nickelodeon's Kids' Choice Awards will be seen in more than 375 million households around the world and in more than 25 languages. Within hours of airing live in the United States and Canada, the show will roll out internationally, providing kids around the world the opportunity to tune into their local Nickelodeon channel to enjoy the show faster than ever. In many international markets, the 2014 KCAs will feature country-specific award categories and nominees, such as Sveriges Favoritstjarna (Favorite Swedish Star) and Migliore Cantante Italiano (Favorite Italian Singer). Voting for the 2014 KCAs will span six continents across 17 localized voting sites, giving kids practically everywhere the chance to decide who takes home a coveted blimp. The 2013 KCAs was the highest-rated ever among kids in many international markets, including the UK, Germany and Singapore. Ratings for the 2013 KCAs were up double-digits YOY internationally, and the show was rated #1 in its timeslot among kids' channels in key international markets, including the UK, Australia, Netherlands, Spain, Singapore, and more. Presenting sponsors of Nickelodeon's 27th Annual Kids' Choice Awards are General Mills, Hasbro Nerf Rebelle™ and Target. Associate sponsors are Bounty®, Capri Sun, McDonald's® and Toyota. Nickelodeon's 27th Annual Kids' Choice Awards is being produced by Nickelodeon Productions in association with Bob Bain Productions. Bob Bain, Jay Schmalholz and Shelly Sumpter Gillyard are Executive Producers. Media outlets can reference the most up-to-date information on Nickelodeon's 27th Annual Kids' Choice Awards by logging onto www.NickKCApress.com. Nickelodeon, now in its 34th year, is the number-one entertainment brand for kids. It has built a diverse, global business by putting kids first in everything it does. The company includes television programming and production in the United States and around the world, plus consumer products, online, recreation, books and feature films. Nickelodeon's U.S. television network is seen in more than 100 million households and has been the number-one-rated basic cable network for 19 consecutive years. For more information or artwork, visit http://www.nickpress.com. Nickelodeon and all related titles, characters and logos are trademarks of Viacom Inc. (NASDAQ: VIA, VIA.B). Follow NickALive! on Twitter, Tumblr, Google+, via RSS, on Instagram, and/or Facebook for the latest Nickelodeon's 27th Annual Kids' Choice Awards News! KaBoom! Entertainment Inc. Acquires Home Entertainment Rights To Zodiak Kids' "Zack & Quack"
The children's entertainment and media news website Kidscreen is reporting the exciting news that KaBoom! 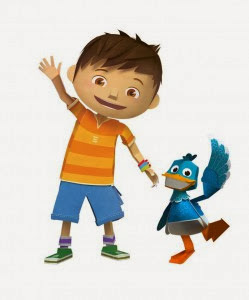 Entertainment Inc., the dedicated kids and family label of the Toronto, Canada-based film company Phase 4 Films, has picked up the home entertainment rights to the brand-new preschool series "Zack & Quack" from Zodiak Kids. The 52 x 11-minute series recently had its world premiere on Nick Jr. Australia & New Zealand and will debut on Nick Jr. UK & Ireland on Friday 7th February 2014 at 4:30pm, and on Nickelodeon and Nick Jr channels worldwide during 2014.
kaboom! now holds the DVD, DTO/DTR (download-to-own/download-to-rent), TVOD (transactional video on demand; excluding SVOD (subscription video on demand)) rights in the USA, as well as DVD rights for Canada. kaboom! will take "Zack & Quack" to retail on DVD in Canada through its Treehouse Presents label, a joint-venture between Corus Entertainment and Phase 4 Films. In the US, kaboom! 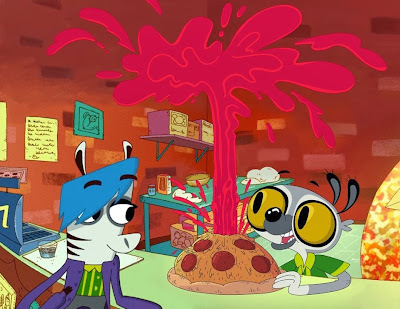 holds a range of home entertainment rights to the show, which follows the everyday life and adventures of Zack and his friends as they journey through their pop-up storybook. 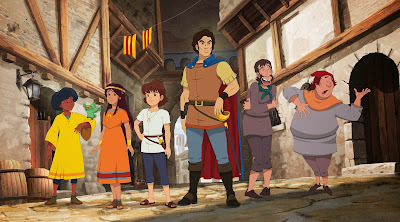 The CG-animated series made its debut at MIPCOM 2013 in October 2013, where it attracted a number of pre-sales. Toronto, Canada-based Phase 4 Films’ kids label kaboom! 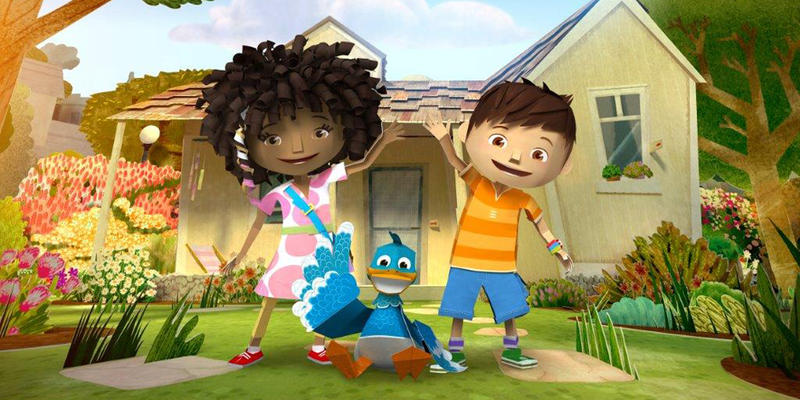 Entertainment has picked up the home entertainment rights to new preschool series Zack & Quack from Zodiak Kids. The 52 x 11-minute series is set to debut this year on Nick Jr. channels globally. kaboom! now holds DVD, DTO/DTR, TVOD (excluding SVOD) rights in the US, as well as DVD rights for Canada. kaboom! will take Zack & Quack to retail on DVD in Canada through its Treehouse Presents label, a joint-venture between Corus Entertainment and Phase 4 Films. In the US, kaboom! 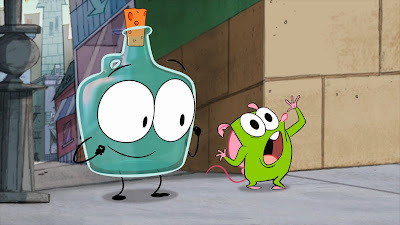 holds a range of home entertainment rights to the show, which follows the everyday life and adventures of Zack and his friends as they journey through their pop-up storybook. The 3D-animated series made its debut at MIPCOM last October, where it attracted a number of presales. Las Tortugas Ninja: ¡¡Nueva Temporada!! 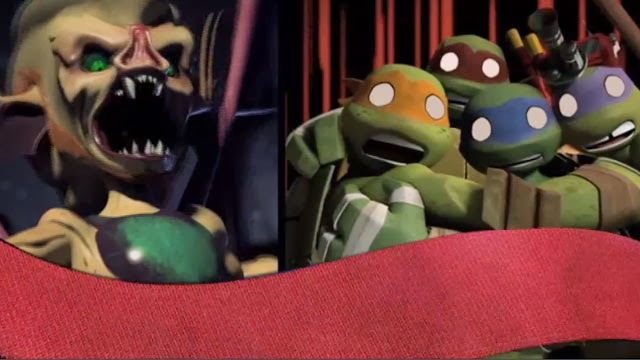 Teenage Mutant Ninja Turtles: New Season! Additionally, Nickelodeon Greece, the Greek version of the world's number one kids' channel, announced that they started to premiere and show "Teenage Mutant Ninja Turtles", locally titled "Χελωνονιντζάκια", from Sunday 26th January 2014. Follow NickALive! on Twitter, Tumblr, Google+, via RSS, on Instagram, and/or Facebook for the latest Nickelodeon Spain and Teenage Mutant Ninja Turtles News! Nickelodeon Spain (Espana) has announced in a post on their official Facebook profile page, Facebook.com/NickelodeonES, the exciting Nickelodeon Europe news that Nick Spain will start to show more brand-new episodes of Nick's all-new live-action original buddy comedy series "Sam & Cat", locally titled "Sam y Cat", from Monday 3rd February 2014 at 9:45pm (21:45)! Follow NickALive! on Twitter, Tumblr, Google+, via RSS, on Instagram, and/or Facebook for the latest Nickelodeon Spain and Sam & Cat News! Nickelodeon, the number-one entertainment brand for kids and families, has announced in the following press release, from TVByTheNumbers.com, the exciting Nickelodeon News that Nick USA closed the month of January 2014 as the top basic cable net in total day with Kids 2-11 (3.0/971K, up +7% over last year) and total viewers (1.8 million)! Nickelodeon's January 2014 performance also marks 12 consecutive months of year-over-year gains with Kids 2-11. The network's monthly ratings win was driven by strong performances from its slate of original live action hits, including "Sam & Cat", "The Haunted Hathaways" and "The Thundermans". "Sam & Cat" led the month with Kids 2-11 (6.8/2.2M), Kids 6-11 (8.9/1.7M), Teens 9-14 (6.9/1.4M) and total viewers (3.9M). These numbers were propelled by the January 18th premiere of the special one-hour "Sam & Cat" episode "#TheKillerTunaJump: #Freddie #Jade #Robbie", which drew 4.8 million total viewers and ranked as Nick's highest-rated telecast with Kids 6-11 since 2012. "The Haunted Hathaways" followed "Sam & Cat" with Kids 2-11 (5.2/1.7M), Kids 6-11 7.0/1.4M and total viewers (2.8M), while "The Thundermans" rounded out the top three live-actions spots with Kids 2-11 (5.1/1.6M) and Kids 6-11 (7.0/1.4M). Among animated series, "SpongeBob SquarePants" won the month with Kids 2-11 (5.1/1.6M), and total viewers (3.1M). Nickelodeon USA was also the months' top-ranked network with preschoolers, averaging a 3.8/480K with Kids 2-5, up +9% over last year and +81% ahead of the closest competitor. "Paw Patrol" won the month as TV's top preschool series among Kids 2-5, with a 6.8/845K - up +48% compared to the same time period a year ago (2013). Nickelodeon USA also won the fourth week of January 2014 (Monday 20th - Sunday 26th January 2014) with Kids 2-11 (3.2/1.0M, up +10% versus year ago), Kids 2-5 (4.0/498K, up +11%) and total viewers (1.9M). "Sam & Cat" was the top live-action series with total viewers (2.9M), while "SpongeBob SquarePants" and "Sanjay and Craig" led as the top-two animated series with Kids 2-11 (6.0/1.9M and 5.2/1.7M, respectively) and total viewers (3.7M and 3.0M, respectively). "Paw Patrol" (7.6/943K) and "Bubble Guppies" (7.3/916K) ranked as the top preschool series with Kids 2-5 for the week. 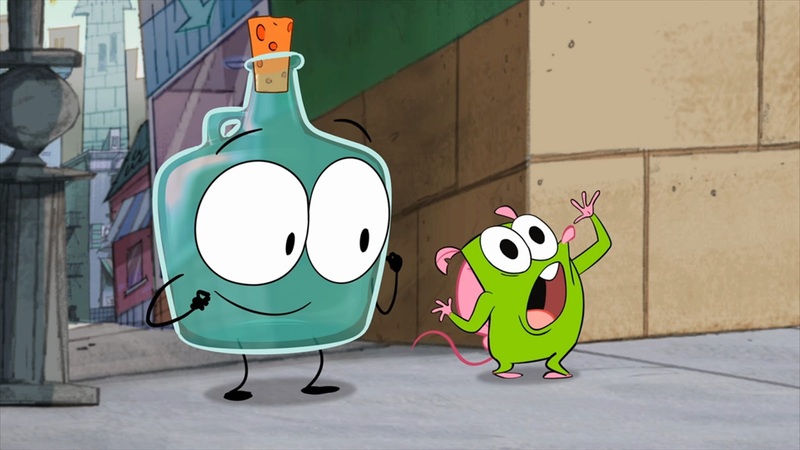 NEW YORK – Jan. 28, 2014 – Nickelodeon closed the month of January as the top basic cable net in total day with Kids 2-11 (3.0/971K, up +7% over last year) and total viewers (1.8 million). Nick’s January performance also marks 12 consecutive months of year-over-year gains with Kids 2-11. The network’s monthly ratings win was driven by strong performances from its slate of live action hits, including Sam & Cat, The Haunted Hathaways and The Thundermans. Sam & Cat led the month with Kids 2-11 (6.8/2.2M), Kids 6-11 (8.9/1.7M), Teens 9-14 (6.9/1.4M) and total viewers (3.9M). These numbers were propelled by the January 18th premiere of the special one-hour Sam & Cat episode “#TheKillerTunaJump: #Freddie #Jade #Robbie”, which drew 4.8 million total viewers and ranked as Nick’s highest-rated telecast with Kids 6-11 since 2012. The Haunted Hathaways followed Sam & Cat with Kids 2-11 (5.2/1.7M), Kids 6-11 7.0/1.4M and total viewers (2.8M), while The Thundermans rounded out the top three live-actions spots with Kids 2-11 (5.1/1.6M) and Kids 6-11 (7.0/1.4M). Among animated series, SpongeBob SquarePants won the month with Kids 2-11 (5.1/1.6M), and total viewers (3.1M). Nickelodeon was also the months’ top-ranked network with preschoolers, averaging a 3.8/480K with Kids 2-5, up +9% over last year and +81% ahead of the closest competitor. Paw Patrol won the month as TV’s top preschool series among Kids 2-5, with a 6.8/845K - up +48% compared to the same time period year ago. Nickelodeon also won the fourth week of January (1/20/14-1/26/14) with Kids 2-11 (3.2/1.0M, up +10% versus year ago), Kids 2-5 (4.0/498K, up +11%) and total viewers (1.9M). Sam & Cat was the top live-action series with total viewers (2.9M), while SpongeBob SquarePants and Sanjay and Craig led as the top-two animated series with Kids 2-11 (6.0/1.9M and 5.2/1.7M, respectively) and total viewers (3.7M and 3.0M, respectively). Paw Patrol (7.6/943K) and Bubble Guppies (7.3/916K) ranked as the top preschool series with Kids 2-5 for the week. Follow NickALive! on Twitter, Tumblr, Google+, via RSS, on Instagram, and/or Facebook for the latest Nickelodeon Ratings News! Nickelodeon Latin America Greenlights New Comedy Series "La Cocina de Talia"
The children's entertainment and media news website Kidscreen is reporting the exciting Nick International News in the following article that Nickelodeon Latin America has commissioned "La Cocina de Talia" for both of Nick LatAm's Spanish and Portuguese-speaking audiences from the networks creative partner, Somos Productions! The news was announced at the 2014 NATPE Market & Conference in Miami, Florida. 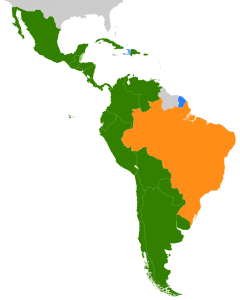 The series is expected to premiere on Nick Latin America in September 2014, with subsequent debuts internationally via Somos Distribution. "La Cocina de Talia", a one-camera produced sitcom, is about the misadventures of a group of kids led by a 12-year-old prodigy chef, who decides to take on the restaurant industry and open her very own Mexican restaurant. Behind the stove, she can take on the world, but outside the kitchen she can't stop getting into trouble. Coming out of this week's NATPE market is news of a new 40-episode original series entitled La Cocina de Talia that has been greenlit by Nickelodeon Latin America for both Spanish and Portuguese-speaking audiences. The series is in the works with creative partner Somos Production and is expected to bow in Latin America in September, with subsequent debuts internationally via Somos Distribution. La Cocina de Talia is a one-camera sitcom about the misadventures of a group of kids led by a 12-year-old prodigy chef, who decides to take on the restaurant industry and open her own Mexican restaurant. Behind the stove, she can take on the world, but outside the kitchen she can’t stop getting into trouble. Nickelodeon and Somos recently paired on the original novela 11 11, En Mi Cuadra Nada Cuadra. Follow NickALive! on Twitter, Tumblr, Google+, via RSS, on Instagram, and/or Facebook for the latest Nickelodeon Latin America and La Cocina de Talia News! All great things must come to a end, and unfortunately, Nickelodeon's hit original musical comedy series "Big Time Rush" is no exception. SKY TV, New Zealand's main pay-television operator, is reporting the bittersweet Big Time News in the 'Kids and Family' area of their 'Television Highlights' webpage that Nickelodeon Australia and New Zealand will be showing the brand new one-hour (two-part) series finale episode/movie of "Big Time Rush", called "Big Time Dreams" on Sunday 2nd February 2014 at 5:00pm. Leading up to the debut of the last ever episode of "Big Time Rush", Nick AU & NZ are inviting Aussie and Kiwi Rushers to join them from 2:00pm on Sunday 2nd February 2014 for a massive sing‐along afternoon, featuring a very special Big Time Marathon packed full with back-to-back episodes of "Big Time Rush", before the final chapter in BTR's story is told with the double episode, "Big Time Dreams", at 5pm. 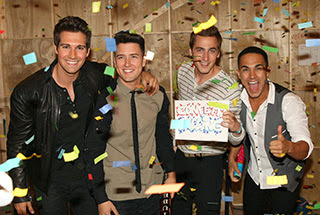 In the all-new episode of "Big Time Rush", called "Big Time Dreams", the BTR guys are invited to the 24th annual Tween Choice Awards, where the boy banders are nominated for a award and are booked to close the show. However, before the foursome can take the stage, they uncover an evil plot to brainwash everyone in the audience. 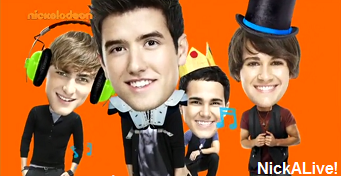 So Big Time Rush have to take down the bad guys and make sure the show rolls on as scheduled. The episode will guest star Austin Mahone as himself, Mindless Behavior as themselves, Nick Cannon ("All That", "The Nick Cannon Show", "Rags", the host of the "TeenNick Halo Awards" and the Chairman of 'TeenNick') as himself, Karmin as themselves, and Alexa Vega as herself. Episode notes: The Tween Choice Awards is a parody of the Teen Choice Awards. The goop that fell on Camille and Jo when they went up to present an award was a parody of the green slime used at the Kids Choice Awards. This is an hour-long TV special which could possibly connected with "Big Time Movie", based on similarities in plots (both contain spy elements and dream plot points). Follow NickALive! on Twitter, Tumblr, Google+, via RSS, on Instagram, and/or Facebook for the latest Nickelodeon Australia & New Zealand and Big Time Rush News! Nickelodeon Germany (Deutschland) has announced in a press release on Nick Germany's "Nick Pressecenter" the very exciting Nickelodeon International news that Nick Germany will start to show the brand-new "The Mysterious Cities of Gold" animated television series, locally titled "Die Geheimnisvollen Städte des Goldes", every weekday at 1:30pm (13:30 Uhr) from Monday 3rd February 2014! 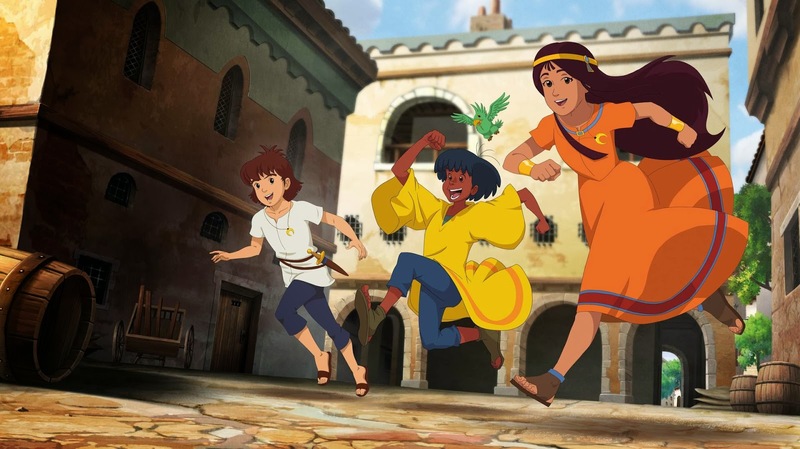 The all-new "The Mysterious Cities of Gold", a French-Belgian co-production and the sequel to the original Japanese-French co-produced 1982 anime TV series of the same name which aired on Nickelodeon USA in the mid-1980's, follows young protagonist Esteban and his two best friends, Zia and Tao, who embark on an exciting adventure around the world through fascinating countries and cities to trace the footsteps of the mysterious cities of gold. At Esteban's side is adventurer Mendoza, who rescued him as a baby from a sinking ship. Together with Mendoza's journeymen Sancho and Pedro, they go in search of the legacy of the Inca: the seven cities of gold. Here, it is hoped Esteban will find his missing father. To celebrate Nickelodeon Deutschland premiering the brand-new "Mysterious Cities of Gold" animated TV series on Monday 3rd February 2014, Nick Germany will be holding a very special two-day marathon of "Avatar: The Last Airbender" ("Avatar – Der Herr der Elemente") over Saturday 1st and Sunday 2nd February 2014, which will feature all 61 episodes from all three books (Book 1: Water; Book 2: Earth; Book 3: Fire) of Nickelodeon's mega-hit anime-inspired original animated series, which will lead up to a very special sneak-peek preview featuring part one of the two-part premiere episode of "The Mysterious Cities of Gold" on Sunday 2nd February 2014 at 7:50pm (19:50 Uhr)! To further celebrate the German debut of "The Mysterious Cities of Gold" in February 2014, Nick Germany has unveiled the channels official "Die Geheimnisvollen Städte des Goldes" website which features show information, exclusive online streaming video clips, a exclusive online game, and a picture gallery featuring images from the brand-new show, which you can visit here at nick.de! Follow NickALive! on Twitter, Tumblr, Google+, via RSS, on Instagram, and/or Facebook for the latest Nickelodeon Germany and The Mysterious Cities of Gold News! The Procter & Gamble Company has announced the exciting Nickelodeon news in the following press release, from Business Wire via Yahoo! Finance (UK & Ireland), that P&G hair care brand, Aussie and Nickelodeon Consumer Products have partnered on a brand-new hair care collection for kids inspired by Nick's hit animated preschool series, "Dora the Explorer"! Aussie Kids, the brand's first-ever licensed product line, will feature Dora, Boots and her cousin, Diego right on the bottles, so kids can have an adventurous bath time voyage with their favorite TV characters. 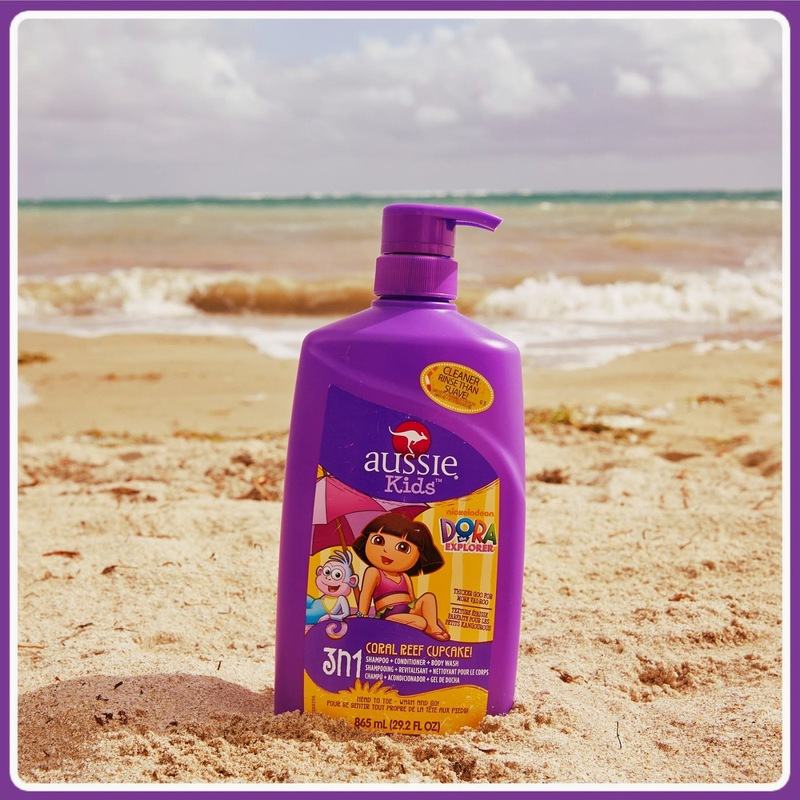 Available now at major retailers across the USA, Aussie Kids is designed specifically for kids ages two through eight, with easy-to-use packaging and scrumptious scents that make bath time quick and easy for all. The collection offers 3-in-1 formulas that include a shampoo, conditioner and body wash all in one to get kids clean from head to toe, and 2-in-1 formulas with a shampoo and conditioner in one to get their hair clean and conditioned in one simple step. A conditioner and detangler round out the collection, offering solutions for Moms to tackle their kids' tough tangles and leave their locks smooth. The full collection offers seven products, each with a different delicious fruity scent and fun characters on the bottle to keep kids engaged and happy as they start to develop a healthy bath time routine. The Aussie Kids Collection can be found at food, drug and mass market retailers nationwide across the USA and online at http://aussie.com/en_US/aussie-kids. P&G hair care brand, Aussie and Nickelodeon have partnered on a new hair care collection for kids inspired by the hit preschool series, Dora the Explorer. Aussie Kids, the brand’s first-ever licensed product line, will feature Dora, Boots and her cousin, Diego right on the bottles, so kids can have an adventurous bath time voyage with their favorite TV characters. "Nickelodeon is delighted to partner with Aussie Kids to create their first-ever licensed hair care line," said Samantha Kanter, Vice President, Packaged Goods, Nickelodeon Consumer Products. "The collection allows Dora fans to experience their favorite explorers in a whole new way by making bath time fun and interactive for kids and parents everywhere." Available now at major retailers, Aussie Kids is designed specifically for kids ages two through eight, with easy-to-use packaging and scrumptious scents that make bath time quick and easy for all. The collection offers 3-in-1 formulas that include a shampoo, conditioner and body wash all in one to get kids clean from head to toe, and 2-in-1 formulas with a shampoo and conditioner in one to get their hair clean and conditioned in one simple step. A conditioner and detangler round out the collection, offering solutions for moms to tackle their kids’ tough tangles and leave their locks smooth. The full collection offers seven products, each with a different delicious fruity scent and fun characters on the bottle to keep kids engaged and happy as they start to develop a healthy bath time routine. "We spend a lot of time talking with moms, and we continually hear how challenging it is for them to find hair care products for their children when they are no longer babies," said April Anslinger, Associate Marketing Director for Aussie. "They want products that provide them with the right benefits for their kid's hair, but still make bath time quick, easy and fun for both mom and kids. The addition of the Dora and Diego characters adds a new, fun element for kids while putting mom at ease because she is using a brand she trusts." The Aussie Kids Collection can be found at food, drug and mass market retailers nationwide and online at http://aussie.com/en_US/aussie-kids. Aussie is known for its wide range of care and styling products - including the iconic 3 Minute Miracle Deep Conditioner and Mega hairspray - that have provided women with quick and easy solutions to get effortless hair for years. The launch of the Aussie Kids collection completes the range for the whole family, with offerings for men, women and kids to provide no-worries, quick and easy hair solutions for all. P&G Beauty & Grooming products help make beauty dreams real for women and help men look, feel and be their best everyday. With 8 billion dollar brands and products available in nearly 130 countries, P&G’s beauty and grooming products delivered sales of over $27 billion in fiscal year 2009/10, making it one of the world's largest beauty and grooming companies. P&G Beauty & Grooming offers trusted brands with leading technology to meet the full complement of beauty and grooming needs, including Pantene®, Olay®, Head & Shoulders®, Max Factor®, Cover Girl®, DDF®, Frederic Fekkai®, Wellaflex®, Rejoice®, Sebastian Professional®, Herbal Essences®, Koleston®, Clairol Professional®, Nice ’n Easy®, Venus®, Gillette®, SK-II®, Wella Professionals®, Braun® and a leading Prestige Fragrance division that spans from point of market entry consumers to high end luxury with global brands such as Hugo Boss®, Lacoste®, and Christina Aguilera®. Please visit http://www.pg.com for the latest news and in-depth information about P&G (PG) and its brands. Emmy award-winning Dora the Explorer continues to be the most watched preschool show on TV drawing 72.9M total viewers and 11.7M preschoolers year to date. Dora the Explorer, created by Chris Gifford, Valerie Walsh Valdes and Eric Weiner, is a play-along, animated adventure series starring Dora (Fátima Ptacek), a seven-year-old Latina heroine whose adventures take place in an imaginative, tropical world filled with jungles, beaches and rainforests. She explores her world just as preschoolers do every day, and the show is designed to actively engage its audience in an interactive quest using a variety of learning techniques. Follow NickALive! on Twitter, Tumblr, Google+, via RSS, on Instagram, and/or Facebook for the latest Nickelodeon Consumer Products and Dora the Explorer News! Happy New Year From NickALive!